If you have questions about any of the above email us at help@gocardless.com. Having opened up the world of Direct Debit to thousands of SMEs across the UK, as part of our mission to rewrite Europe’s recurring payment infrastructure, we are proud to introduce GoCardless Pro. GoCardless Pro is specifically designed for larger organisations coupling the simplicity our customers love about the original GoCardless product with the complete control over payments and customer experience that large organisations need. We’re already working with The Guardian and many other multinational organisations, to provide them with a payments solution that lets them focus on what’s important to them. With GoCardless Pro we offer a simple, modern REST API which allows you to seamlessly integrate online Direct Debit with your website or CRM. This includes full documentation, client libraries and technical support to assist with integrations. How is it different to the original GoCardless product? With GoCardless, you use our SUN to make the process of taking payments simpler and cheaper. It means you can get set up and start taking payments in minutes and we do all the hard work for you. GoCardless Pro is specifically designed for larger organisations who want the simplicity of our Basic product but also need a higher level of control over the process. We will arrange for these organisations to get their own SUN and then we act as a Facilities Managed Direct Debit provider. Similarly to the Basic product we then do all the hard work for you saving you from having to get an SUN from your bank and jump through compliance hoops whilst allowing you to collect from your customers in your own name. How is that different to other Direct Debit providers? There is no need to extract or submit payment or refund files with GoCardless. All submissions are passed to us via the API and we ping you with the information via webhooks. Our webhooks allow you to build out real-time reporting and let you instantly notify customers and merchants of any event. This means you’ll always know as soon as a payment fails so you can resolve any disputes more quickly and easily. We have a simple transaction fee and a flat monthly fee for merchants. There are no hidden fees for things like chargebacks, payment failures or adding new customers. No set-up cost and a simple REST API to build from. As well as the API, merchants will have access to the GoCardless Pro dashboards. If a banking error or failure message is received we will immediately let you know the reasons for the failure. We will then work with you to solve any issues and then resubmit the payment. Competitors sometimes pass these back to the merchants for them to sort out themselves. Refunds are processed in the same API, whereas competitors often deliver a separate reporting flow on refunds meaning more work for you. GoCardless Pro is the first product to offer both UK and SEPA Direct Debit in one simple API. This means you can take payments from across Europe without needing to integrate anything else. If it sounds like GoCardless Pro could be the solution you’ve been looking for you can find out more here or get in touch with our sales team for a free quote today. The standard GoCardless API and dashboard will continue to work as normal. GoCardless is still the perfect option for most of our existing customers - giving simple, low price payments with easy set up and minimal admin. But if you are one of our users who have been hoping to have more control over your payments then GoCardless Pro could be the product for you. So that’s the big news for today, but we’ve got lots of other exciting features in the works to save you even more time & money – be sure to check back to find out what we have planned! Having opened up the world of Direct Debit to thousands of SMEs from across the UK, GoCardless has today announced their enterprise product, GoCardless Pro. The new product is specifically designed for larger businesses and will allow them to take recurring payments with ease. The Guardian has signed up as an early user of the service. GoCardless, the payments company simplifying online Direct Debit, is today announcing the public launch of GoCardless Pro, an exciting new product that will revolutionize Direct Debit for large companies. Since launching in 2012, the UK tech start-up has quickly grown to serve over 5,000 SMEs, collecting more than £500 million per year with 600% year-on-year growth. Costing 60% less than credit card based solutions, GoCardless' existing SME product is a clear market leader for ease of access, flexibility and simplicity. The latest release is designed for larger enterprises, combining the simplicity of the original product with complete control over payments and customer experience and brings it directly into competition with traditional bureaus like Bottomline. Until now, companies wishing to collect by Direct Debit have been forced to use clunky software which requires them to staff whole departments to manage these collections. GoCardless Pro will allow them to automate these operations using the GoCardless API, reducing operational complexity and cost, whilst improving customer experience. An early customer for GoCardless Pro is The Guardian. Their Director of Consumer Revenues Julia Porter explains that, "The Guardian is always looking to give the best customer experience and has chosen GoCardless to make its recurring payment experience as seamless as possible." GoCardless raised $7 million in a round lead by Balderton Capital earlier this year in order to target enterprise customers and this is the first of a few major releases designed to shake up the space. With organisations like the Guardian already signed up it seems to be working. 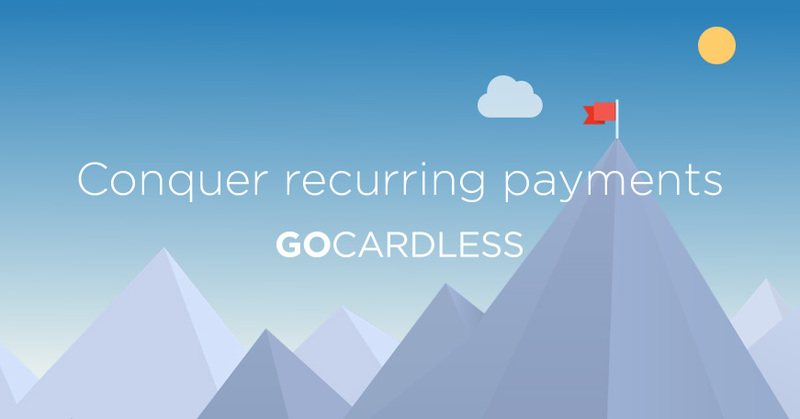 GoCardless enables businesses to control their payments, not be controlled by them. It is a simple service for collecting Direct Debit payments online. Direct Debit is the best way to take recurring payments in Europe, with lower failure rates, lower fees and increased flexibility vs cards. The company launched in 2012 and now serves over 5,000 UK SMEs collecting half a billion pounds per year. It has raised $12m investment from Balderton Capital, Accel Partners, Passion Capital and YCombinator. This week we finally released our definitive guide to recurring payments. It's a free and interactive guide which helps you to find the right payments option for your business by focusing on the things you really care about. As a startup, GoCardless isn't just trying to grab a share of the existing payments industry - we're trying to disrupt it. Payments providers can be notoriously vague about their costs, failure rates, etc. This makes it incredibly hard to make an informed decision about what's best for your business without spending hours online or on the phone to sales teams. We want to change this so we've written this comprehensive guide to give businesses everywhere the information they need to choose the right payments option for them - all in one place. Cost: How much does it cost to get set-up, what are the transaction fees and how much admin time does it require? Set-up: How long does it take to get set up and taking payments and how difficult is it? Conversion: How many people actually convert to making a payment and how is it possible to improve this? Churn: How many of my payments will fail and what support will I get to resolve failures? Experience: What customer support do providers offer? How responsive are they and how much support do they offer for dispute resolution? International: Which countries can I collect payments in with each provider? Timings: How long do payments take to arrive in my account? We've set out to make the best content on recurring payments anywhere - something which every small business would be able to benefit from. If you have any questions or feedback, we'd love to hear from you so please get in touch at charlotte@gocardless.com. If you know anyone else who might find the new guide useful please send them our way with this link to the guide. Are you ready to conquer recurring payments? The Foundation of Hearts is a not-for-profit made up of Heart of Midlothian FC fans aiming to save the club from administration by becoming its majority shareholder. Hearts went into administration last June with debts of about £30 million. Since then, the Foundation of Hearts has signed up over 8,000 fans to make monthly contributions of £10 - £200, by Direct Debit with GoCardless, to fund a fan takeover of the club. On Friday 9th May, the Foundation made a huge step towards this – and to taking the club out of administration before next season - when Ann Budge became the majority shareholder of Hearts FC. Budge will become executive chair on a “no-fee” basis and then plans to transfer ownership over to the Foundation within five years. To find out more about how the Foundation of Hearts use Direct Debit, check out their amazing customer story or book a chat with one of our Direct Debit experts.